People often ask which dating site is right for them, because most dating sites offer a one-size-fits-all, quiz-based experience. 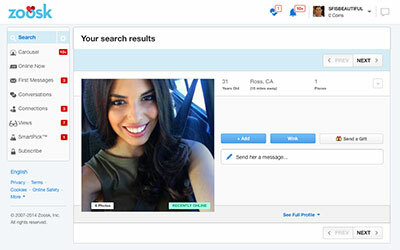 Instead of taking a one-time snapshot of who you are, Zoosk offers a more personalized experience in online dating. Zoosk's unique SmartPick™ Behavioral Matchmaking technology is constantly learning from the actions of over 25 million visible members in order to deliver better matches in real time. You won't have to go through hundreds of profiles to find a connection because Zoosk is constantly updating matches to fit your romantic preferences. 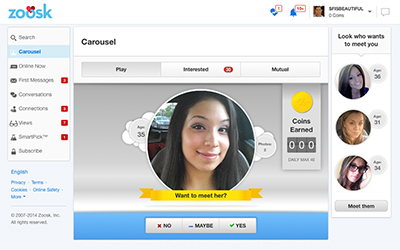 Zoosk's unique SmartPick™ Behavioral Matchmaking engine makes Zoosk a smarter place to date. The profiles you click on, who you send messages to, who you respond to, etc., determines which profiles Zoosk shows first. It's all designed to pair you with people you'll click with. With the #1 Dating App and a top 10 grossing App overall in the Apple App Store, Zoosk is the market leader in mobile dating. 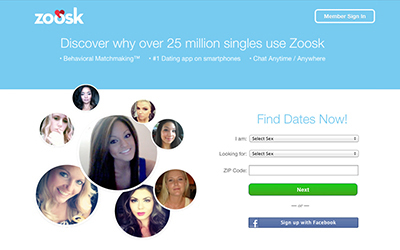 Available in over 70 countries and translated into 25 languages, Zoosk is a global online dating platform. View Zoosk singles by photos and age one-at-a-time, based on who Zoosk's SmartPick™ Behavioral Matchmaking engine thinks you'll be mutually attracted to. It learns as you click to show more relevant results. Enter your criteria for a date and search. Zoosk shows you results that fit as many of your criteria as possible, while adjusting based on suggestions from the SmartPick™ Behavioral Matchmaking engine. 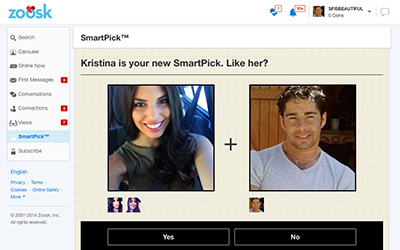 SmartPick™ shows you one profile every 24 hours, based solely off of what we know about you and your preferences from the clicks you've made, messages you've sent, and more. Simply click "Like" and if the other person likes you too, we'll make the introduction. Sign up for Zoosk and immediately begin browsing Zoosk singles and send messages to members you are interested in for free. The SmartPick™ Behavioral Matchmaking engine is constantly learning from your clicks and messages to show you singles with whom you're likely to discover mutual attraction. Once you find someone you want to respond to, you can become a paying member. Safety is a top priority at Zoosk. A human being verifies every Zoosk profile before it becomes visible, and they use proprietary technological solutions to verify that people are who they say they are. Zoosk provides private, invisible browsing to all members and guarantees never to disclose any of your personal information to a third party. Browse singles on Zoosk for free, and even send messages. Once you've been introduced to someone you like, you can upgrade to a paying membership. Subscriptions unlock access to messaging, winking, chatting, the ability to find out who viewed your Dating Profile, and SmartPick™ features. Start at $29.95 per month for one month, or $19.95 per month for three months; the cost of Zoosk decreases as you purchase a longer subscription. You may also purchase virtual currency to boost your profile's visibility, send gifts to members, and use upgraded messaging features. 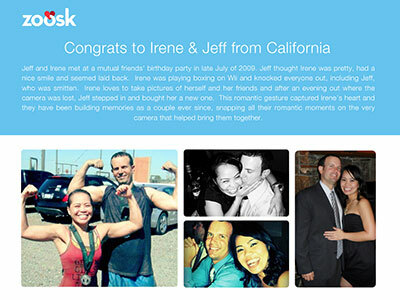 Zoosk highlights many happy couples who've met using the service on the Zoosk Facebook page. The company's mission is all about empowering people to lead a more fulfilling love life, so they take your success on Zoosk seriously. Our Zoosk review found that this dating site offers a more personalized experience in dating, using smart technology to pair you with people you're likely to click with. Lots of couples have met, fallen in love, dated, gotten married and/or started a family using Zoosk. Not all submitted reviews are posted but all submitted reviews are factored into our rating. Consumer-Rankings.com believes the posted reviews best reflect the overall opinions of all submitted reviews. I met an amazing guy in a week and a half! I joined Zoosk on a whim and ended up meeting the man of my dreams. He was geographically undesirable (he found me), but we clicked on all cylinders (email / phone) and pursued the connection. We are now living together and planning our future together. Needless to say, I am still shocked, but oh, so happy and content. Thank you Zoosk!!! i really like zoosk. there are some things that are limited on the site but i am able to put in my profile what kind of man im looking for: personality, bodytype, height. smoking yes or no. drinking yes or no. i get constant views, many times you can tell which guys are more interested than others based on this only. in my case, i was limited in my finances and couldnt purchase a subscription for a few weeks. i could still see who had viewed me. another thing that i like about zoosk is they have an "insights" area where you can see where theyve compiled all the info of who you like("view")and who likes you("viewed"). who youre attracted to and whos attracted to you. theres also a compatibility rating at the bottom of some profiles. this is the site in subscribing to. I am in my 60's and female and they really have the best single men out of all the sites...I have tried. I was on this site about two years ago. In February of 2013 I met someone. We were engaged after three weeks and happily married in a church wedding in July of 2013. We just recently celebrated our first anniversary. I might also mention that we are 69 and 71 years old. I have been on many dating sites off an on over a 6 year period and consider Zoosk the very best one. It is a fun site. The chat request can get overwhelming visually. I did get one date with a nice man. Really fun to use. It's like facebook for dating. Really fun site. I would recommend Zoosk to my friends.